Lancelot is written about around 1177 AD in Chrétien’s Le Chevalier de la Charrete (or The Knight of the Cart). In this legend, the wicked Meleagant kidnaps King Arthur’s Queen Guinevere and takes her away to the land of Gorre. Chrétien de Troyes composed 'Le Chevalier de la Charrette' at the request of the Countess Marie de Champagne, daughter of Louis VII of France and Eleanor of Aquitaine. Like other courtly ladies of the period, Guinevere required a lover, and the Lancelot - a convenient and suitable hero - was the man for the job. After the failure on Sir Kay to rescue her, Lancelot and Gawain are sent to save her. Lancelot meets a dwarf in a cart, and the dwarf offers to help in the rescue of Guinevere if Lancelot joins him in the cart. The rules of chivalry say that there is shame for a knight to be in a cart. Lancelot considers this, but immediately decides that his love for Guinevere is stronger than his pride. Gawain takes another road to save Guinevere, but Lancelot takes this cart, saves her, and has the first of a number of adulterous liaisons with her. This legend tells of Lancelot crossing of the Sword Bridge, a bridge consisting from a sharp blade. During the ensuing combat between Lancelot and Méléagant (which Lancelot nearly loses because he could not stop himself gazing upon Guinevere) Lancelot eventually is about to kill Meleagant, but King Bagdemagus successfully pleaded with Guinevere to stop the fight so his son's life could be spared. Lancelot was forced to defend her honour a second time, when Méléagant later accused Guinever of an affair with Kay, and once again Bagdemagus successfully pleaded for his son. Lancelot finally slew Méléagant in combat at King Arthur's court. In Le Morte d'Arthur (Book 19) Queen Guinevere was picking flowers in the woods behind Westminster, with her ladies-in-waiting and page-boys, plus ten of the Queen's Knights. Sir Meliagrance (Méléagant), aware of Lancelot's not being present, attacked with 160 men-at-arms. To avoid her knights being killed, Guinevere surrendered herself to Meliagrance, but sent a messenger with her ring to Lancelot with a plea to rescue her. Lancelot rode to her aid on his horse, but it was killed by archers so he commandeered a cart and rode in it to the gates of Meliagrance's castle. Meliagrance immediately surrendered. 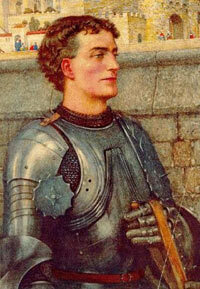 Guinevere and the Queen's Knights were saved and Sir Lancelot became known as 'Le Chevalier du Chariot'. As in Chrétien de Troyes story, later that night Lancelot climbed into Guinevere's bedroom by forcing the window and injuring his hand ). Malory continues: "Sir Lancelot went unto bed with the queen, and he took no force of his hurt hand, but took his pleasance and his liking until it was in the dawning of the day ... and when he saw his time that he might tarry no longer he took his leave and departed at the window, and put it together as well as he might again." The following morning Meliagrance saw the blood and claimed Queen Guinevere had been dishonoured by one of her wounded knights. Lancelot took exception of this besmirching of the Queen's honour. Meliagrance threw the gauntlet, Lancelot accepted, and the duel was arranged. But Meliagrance tricked Lancelot into falling through a trap door in his castle down into a cave, but Lancelot was able to escape, and at the last moment appeared at the duel, and with one arm tied behind his back he deftly cut Meliagrance's head in two.